We are in the final stages of completing our WW1 project entitled ‘Over the Wire’ which has been funded by the Heritage Lottery fund. What a fabulous project this has been! We have created lots of different projects over the years, but this project has been one of our favourites and will be remembered by many for years to come. The Over the Wire project was initially designed to help young people of all ages connect with the Great War and to help them understand the importance and significance of the Act of Remembrance in todays society. Throughout the project young people have engaged in educational visits to an array of museums including The Green Howard’s Museum, and the Heugh Battery Museum. All of then have participated in a variety of theoretical workshops designed to ensure they fully understand the impact WW1 had on our home soil, but also abroad. They have visited the Ypres salient in Belgium and received invitations to perform at some of the most iconic World War Sites in Belgium including the Menin Gate, Tyne Cot Cemetery, The Christmas Truce Field, Essex Farm, Talbot House and Cloth Hall. To perform in Belgium was a huge honour and had a huge impact on our young people. During the project our staff conducted workshops in 17 primary schools in Hartlepool. 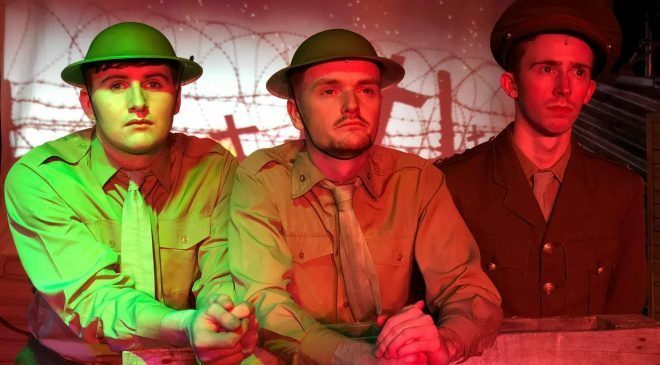 They worked with 1500 young people and selected 200 of those young people to work with our core students on a World War 1 performance piece entitled ‘Honoured’. The performance work was staged at Hartlepool Borough Hall on the 24th and 25th October 2018 and was watched by over 500 people from the local community. The production was designed to honour those residents of Hartlepool who had lost their lives in the WW1 Hartlepool Bombings. The performance had a phenomenal impact on the young people, teachers and audience members. After the performance we were inundated with hundreds of wonderful comments thanking the company for providing a pedagogic platform to connect and remind todays young people about the sacrifice made by their ancestors. Tis was quite simply a huge and innovative commemorative event. In addition to the Hartlepool performances, we also toured the production to Etherley in County Durham. However, this time we commemorated the men and women who had resided in Etherely prior to WW1 and whom had been killed in action. One of these men was a gentleman called Fred Gaskin who served with the Green Howard’s in WW1. Unfortunately, Fred Gaskin lost his life (aged 21years of age) on the first day of the Battle of the Somme. His name is inscribed on a chalice in Etherely Methodist Church, so it seemed so fitting to perform our commemorative production at Etherely Methodist Church. Once again the performance was seen by hundreds of the local community and had a huge impact. Our young people have excelled throughout this project. We are delighted to report that our core students have been awarded a special commemorative WW1 Arts Award certificate for their hard work and application throughout this whole project. For more information about the project, please visit our ‘Over the Wire’ project page. Please take the time to watch the video below (click ‘Over The Wire’ link) which provides a glimpse into the project. This has been one of our favourite projects. Thank you to Heritage Lottery Fund for helping to make it happen. So much has been learned and there is much hope for the future. We will remember.